The West Virginia hills are indeed majestic and grand, but there are secrets in those hills and mysteries that have yet to be solved. If you’re looking for things to do to celebrate Halloween this year, below are 10 suggestions on how to have the perfect Halloween in the Mountain State. The imposing Gothic structure that once housed some of the worst of the worst evildoers in the state, West Virginia State Penitentiary in Moundsville, West Virginia, stands as a beacon of darkness to those who drive by it, Opened in 1876, it closed its doors nearly 120 years later, but not before countless deaths took place. In celebration of Halloween each year, the building is opened for tours like the Dungeon of Horrors and Zombie Paintball. Do you dare enter where few have returned? Excited to explore more places like West Virginia Penitentiary soon! What do you get when you combine history and candy? You get True Treats Historic Candy store in Harpers Ferry, West Virginia. The only candy store in the country that uses research techniques to find and offer authentic candy types and flavors that date back to the late 1500s, if you can’t find what you’re looking for here, it doesn’t exist. 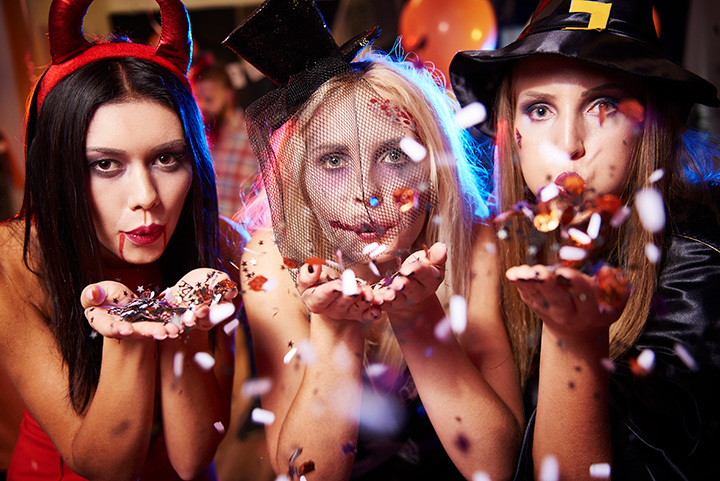 Food Magazine has called True Treats a “Must-See Sweet Spot” and one of the top 50 candy store destinations in the U.S.
Great costumes for your Halloween or party celebration can be found at The Illusive Skull in Fairmont, West Virginia. Everything from cute to creepy, you’ll find it here, and the helpful staff will assist with any items you can’t find. Besides costumes, they have a great line of realistic-looking weapons for the coming Zombie Apocalypse, and a large selection of monster and clown masks. Open every day except Sunday during the rest of the year, they’re open longer hours and on Sundays in October. Used as a psychiatric hospital from its opening in the late 1800s until it was shut down by the government for overcrowding in 1994, the Trans-Allegheny Lunatic Asylum is host to the Asylum after Dark, where demented doctors bring their patient’s worst nightmares to reality. Not child-friendly for those under 13, and even adults may have difficulty escaping. If you suffer from sensitive nerves or a weak heart, then you don’t want to come to the Haunted School of Terror in Weirton, West Virginia. This former school building holds 27,500 square-feet of intense fear-producing attractions that will make you wonder if you’re seeing reality or fantasy. Can you make it through without losing your sanity? Safe family fun is what you’ll find at the Haunted Hayride in Berkeley Springs, West Virginia. Come out each weekend in September and October for spine-chilling scream-rendering fun as you’re taken through turns and around bends to see what lays in wait for you. Very kid-friendly and worth the drive and cost. No Halloween would be complete without visiting the Mothman Museum in Point Pleasant, West Virginia. One of the state’s unresolved mysteries, the legendary Mothman still intrigues and mystifies people. Open year-round every day, the museum is the only display and collection of original press clippings and memorabilia from the strange events that happened in 1966 and 1967 and led up to the terrible collapse of the Silver Bridge, which resulted in the death of 46 people. The tiny little community of Glenville, West Virginia, in Gilmer County is nestled quietly in the valley near the Little Kanawha River. Glenville State College, originally Glenville State Normal School, built in the late 1800s offered the opportunity for students to become teachers and was known as “The Lighthouse on the Hill.” According to local legend, however, there is a dark side to the college campus. In early 1919, a local woman named Sarah Louisa Linn lived near the campus and was found bludgeoned to death. Her murderer was never found, but there have been many accounts of strange occurrences and noises happening in and around the area of the campus. In the late 1800s, a farmer and part-time undertaker created a unique embalming procedure that he received permission to test on the bodies of two women who had recently died at the nearby West Virginia Insane Asylum in Weston. Although a patent was supposedly applied for, no record has been found describing what the procedure was, but it worked and the mummies were put on public display with P.T. Barnum and toured the world until they were brought back to the area. Hidden in a barn for years before being discovered again, they are now on display again at the Barbour County Historical Society Museum in Philippi. In keeping with insightful events that include mystery and personal demons, the Greenbrier Valley Theater in Lewisburg, West Virginia, offers two timeless classics, “To Kill a Mockingbird” by Harper Lee, a Southern-Gothic tale about racism and bigotry, and “A Long Day’s Journey into Night” by Eugene O’Neill, the story about what happens when anger, resentment, and a dark private life are exposed.